Do you know a fearless feline or miraculous moggy? The National Cat Awards are back – and we’re after the country’s top feline tales. Nominations for the awards, which once again are being sponsored by Purina®, open today and the categories are as follows. The winning moggies, and the overall National Cat of the Year, will be announced at a glamorous awards ceremony at London's Savoy Hotel on Thursday 4 August. 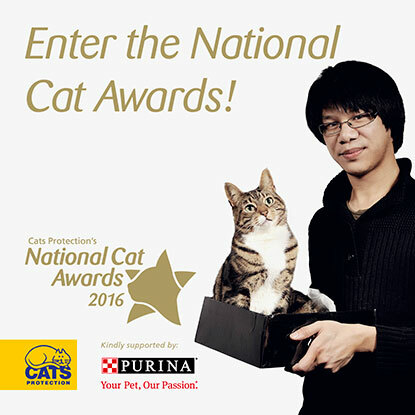 The event will be attended by celebrity judges who will present the awards and pay tribute to the nation’s top cats. Need a bit of inspiration? The winner of the Purina® Better Together award in 2014 was Mr Chips, owned by Anna-Marie McConnell and Ian Turner, of Llandudno, Conwy. Mr Chips was found as a stray with a badly broken leg, left with a permanent disability and also spent six months in a rescue centre awaiting a home. But it didn’t stop him living life to the full and when new owner Ian Turner was diagnosed with a complex medical condition, Mr Chips proved to be an incredible support. To enter your cat, visit www.cats.org.uk or contact our national Helpline on 03000 12 12 12 or helpline@cats.org.uk to request an entry form.